Last Wednesday (after placing an urgent & anxious call to my nurse at my OB's office), my husband and I got to see the Bean again. Why anxious? Why urgent? I believe it was mainly because we had entered the 10th week, another (and the last) trigger week for me. In January 2010 when I was what we thought was 10 weeks pregnant, I found out my Peanut had never really made it past week 7. I was told it was a missed miscarriage. So, even though I wasn't experiencing any of what most people (and the medical community) would classify as miscarriage symptoms, that didn't mean much to me. What is "normal" for most women hasn't been normal for me in a couple of years. I can't trust the normal, obvious signs of pregnancy loss. So, I had a minor freak-out. I had not seen our baby in 3 weeks and how could I be sure that everything was fine? And she turned the screen to us and pointed at that familiar flickering spot on the screen. *Deep sigh of relief* And then my husband and I marveled at what we were seeing. We couldn't believe how much bigger Bean was in just 3 weeks! And Bean looks like, well a baby! Before Bean was kind of a shadowy white blur. Watching my husband's reaction to all of this is something I will always cherish. This is his first child. I have a son from a previous marriage, so all this isn't completely new to me. But for my husband this is new, amazing ground. After taking all the necessary measurements (and the Bean measured in at just about exactly 10 weeks ;) ), it was time for the tech to capture the heart rate. Bean decided that he didn't want to cooperate much initially. Bean was bebopping! We watched as he moved his hands back and forth and touched them together. (Our baby has hands, and fingers, and legs!!) She tried 5 times before the little one finally stopped moving around just enough for her to finally catch that little heart rate- 164 beats per minute! 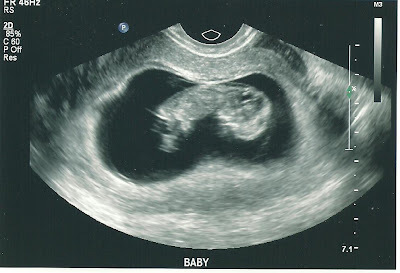 As a mother to two beautiful babies that I haven't met yet and a sufferer of anxiety, this ultrasound has brought me peace of mind. While I know I am never really out of the woods (and those fleeting thoughts that all of this still could come to an abrupt end still plague me now and again), I feel more confident, more hopeful. I have found myself actually experiencing feelings of nostalgia now over my pregnancy with my son as this one progresses instead of constantly comparing it to my last 2 miscarriages. That is definitely a step in a better direction for me. More often than not, I now experience a symptom or notice the more pronounced rounding of my belly and it reminds of me of how I felt when I was carrying my son. For that and for the health of this baby I am carrying now, I am grateful beyond words. Hello there Bean! So glad everything is going well with the babe! I am also very happy that your physician team is helping you through the trigger days by allowing you an U/S to see babe. Aw stupid keyboard that is suppose to be http://www.digital-damita.net arugh! Congrats! What a great pic!